3uTools (vShare alternative) is a third-party application compatible with windows PC or Mac devices. Through this tool you can connect your ios device to the computer by using USB cable.3uTool can use as a jailbreak or without jailbreak with software bundle which enable you to monitor various systems within your ios devices. 3U app and vShare have same features.When you start to use windows 3uTool you can recognize it is the best software for control ios devices. If you want to transfer full data from old ios devices to new one, 3u Tools is the quick, easy method. It can be done with Toolbox, Transfer data icons on 3u Tools by connecting old and new ios devices into the 3uTools.In addition you can do lot more things with this application. 3uTools download process is same as vShare. 3uTools is not just jailbreaking or app store for the ios devices. It fulfills your device in more ways than one. The tool makes it quite easy to manage your multimedia file. The latest 3u Tools comes with some more advanced features. The most necessary features collection here for ios devices such as icon management, garbage cleaner, data migration, data backup, ringtone maker, video converter and icon deletion. Provide good support to work with all ios devices and top class online store. Numerous apps, ringtones and wallpapers are free to install. 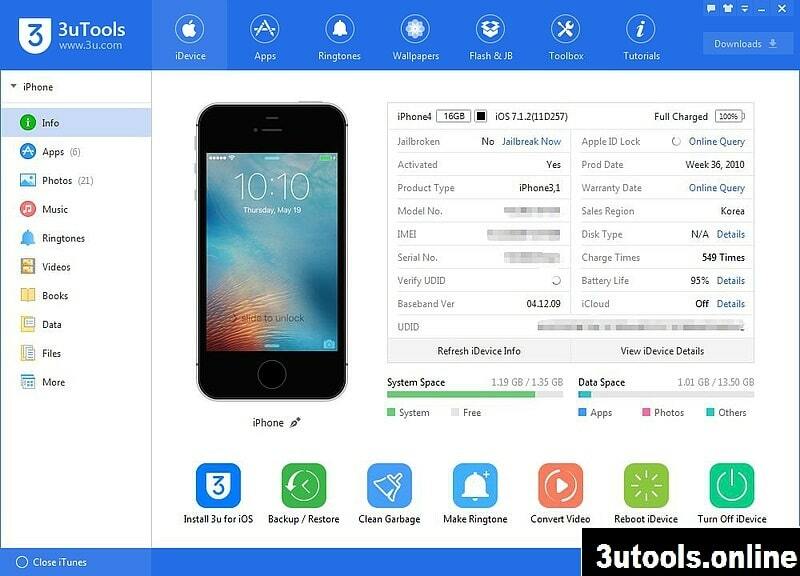 Get all the information about your ios device like model number, IMEI, Serial number and even color also…etc on your computer screen via this 3uTools. No doubt about 3uTools claims as the most efficient ios data management tool in currently available. Its handy features always attractive users mind. Huge online store has the ability to fill anyone’s need.3U features everything in a simple and easy to use interface. This app is relatively easy to install but may require you to have some medium PC knowledge and a good understanding of jailbreaking ios devices. If you need to download genuine ios apps free with one click 3uTools will perform its best for you.